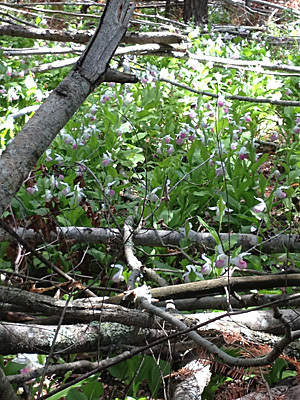 Here are a few photos from the native orchid salvaging trips that staff from the MN Landscape Arboretum and the Eloise Butler Wildflower Garden made in June 2012. The plants were collected near Pennington, MN in Beltrami County as part of an effort to conserve these specimens by planting them at the Eloise Butler Wildflower Garden and MN Landscape Arboretum and to provide enhanced education on native orchids at the both sites as a result. The community in the area has stored over a thousand Showy Lady's-slipper plants in storage beds in a nearby forest while road construction takes place. They will be replanted along the new road once the construction work is completed. 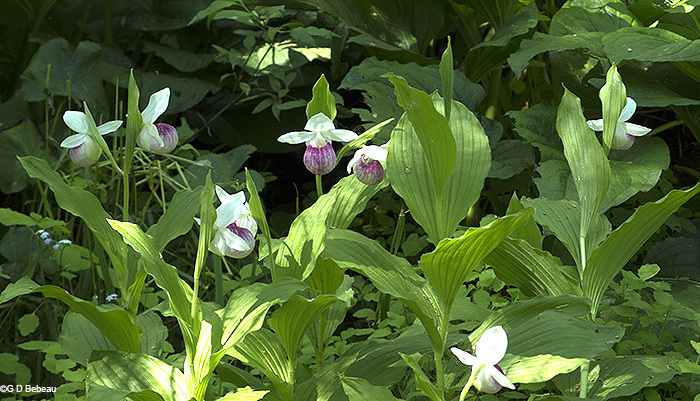 The Showy Lady's-slippers, Cypripedium reginae Walter, are one of the species that we salvaged from the area. 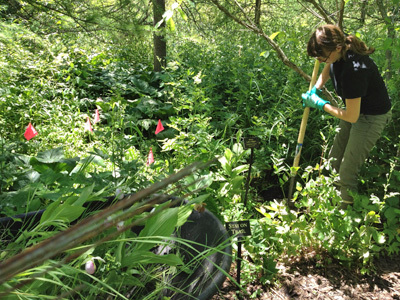 Below: 1st - photo: An Eloise Butler Wildflower Garden staff member planting the salvaged Lady's-slippers. 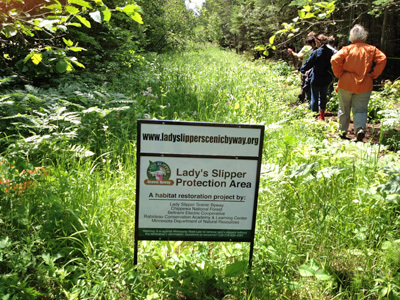 2nd photo - A storage area for rescued Showy Lady's-slippers in Beltrami County. A group of the 2012 rescued plants growing nicely with the Skunk Cabbage in Eloise Butler two years later. This next article reports on a rescue in June 2005. 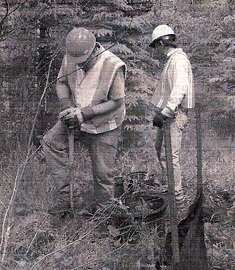 Larry Puchalski of MnDot, left, and Richard Gjertson of the U of M Landscape Arboretum, were part of the lady’s-slipper rescue mission. Photo - Minneapolis Parks. In honor of the legacy of Eloise Butler and as part of the Garden’s mission to enhance the diversity of plant life found within the Garden gates, a trip was taken in June 2005 to northern Minnesota to rescue several Showy Lady’s-slipper orchids - saving them from destruction in a road-building project. Although it is unlawful to dig up this precious Minnesota State flower, these threatened plants were collected with the permission, assistance, and enthusiasm of the Minnesota Dept. of Transportation - for transplanting in a public wildflower garden such as ours. With only a week remaining before their eminent demise, the clumps were carefully removed and transported to the Eloise Butler Wildflower Garden and planted the following two days. Several clumps, large and small, were carefully dug from an area very similar to our tamarack swamp in the Garden. With patience and care, it is our hope that these lovely additions to the Wildflower Garden will enhance the spirit and beauty of the wetland garden for years to come.